Oxfordshire County Council has issued a Prohibition Notice under the Government’s Review of Old Minerals Permissions (ROMP) legislation preventing the extraction of sand and gravel at Thrupp Farm in south Radley. This potentially lifts what was a real and imminent threat of gravel extraction recommencing in Radley. Gravel extraction has taken place in South Radley since the mid 1940s and some old permissions for extraction remain dormant. In 1995, Government introduced legislation to review these old permissions either to bring them to an end – to end planning blight, or to ensure that any operations were carried out in accordance with modern conditions – to ameliorate the adverse impacts on the environment and on nearby communities. Such conditions were not attached to the original permissions. The ROMP legislation, in conjunction with the Environmental Impact Assessment Regulations 1999, established a process under which quarry owners had to carry out an Environmental Impact Assessment (EIA) of any proposed work under an old permission and submit the required Environmental Statement (ES) by a mutually agreed date. Failure to submit by this deadline would then result in an automatic two year suspension period, during which no mining operations could be carried out at the affected sites. If the Environmental Statement was not received by the end of the period of suspension, a prohibition order would be issued, which, following ratification by the Secretary of State for Communities and Local Government, would mean that the permission is permanently revoked. As part of this process, J Curtis and Sons Ltd has resurrected a dormant permission to extract gravel at Thrupp in Radley from the area known as Nyatt and Bruney fields, between Barton Lane and the River Thames. In spite of an extension of time granted by Oxfordshire County Council, this permission entered the two year suspension period at the end of September 2010, which meant that Curtis had to complete the EIA and submit an ES by the same date in 2012, or lose the permission completely. At the end of September 2012, at the eleventh hour, Curtis submitted a proposal which would have involved excavating most of the area south of Barton Lane between Lake I and Longmead Lake and the River Thames (Areas K, L2 and M on this map). However, Oxfordshire County Council has deemed that the submission fails to meet the statutory requirements of an Environmental Statement and is therefore invalid. However, as the submission was made right at the end of the suspension period, the applicant has no time to prepare and submit another, in which case Oxfordshire has had no choice but to issue a Notice of Prohibition Order. Provided that it is ratified by the Secretary of State, this will finally bring to an end over six decades of gravel extraction in Radley and remove the long-term planning blight that has been affecting this area for decades. Hopefully this will, at a stroke, wipe the planning slate clean and allow the area to be developed in a way that is more amenable to the local community and economy by creating opportunities for nature conservation and community recreation coexisting with business and agricultural use. Any development would then be subject to proper planning controls and enforceable modern conditions. Had the application gone forward, it would have resulted in a further 15-20 years of extraction on the outskirts of Abingdon while prolonging the accompanying entanglement of unresolved planning issues that has exerted a stranglehold on the wider area for so long. 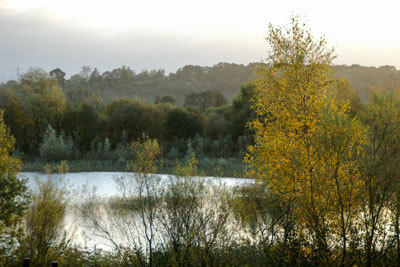 Significant damage to the Radley Lakes Local Wildlife site would also have occurred, including to Orchard Lake and its surroundings, which many consider to be the Jewel in the Crown of the Radley Lakes, on account of its very high conservation value. Excavations would have taken place almost up to the bunds surrounding the ash-filled lake known as “H/I” (See map) and Orchard Lake, as we know it, would have been obliterated. New lakes would have been created of course eventually offering new opportunities for people and/or wildlife, but at the price of a prolonged period of disturbance and planning uncertainty. The Prohibition Order makes provision for a consultation period, which ends on 10th December, during which anyone affected may make representations to the Secretary of State as to why they think the Prohibition Order should or should not be made effective. Following an appeal by J Curtis and Sons Ltd, a Public Inquiry into whether the Prohibition should be upheld will be held on 18-19 March 2014 at the Guildhall in Abingdon.